Q1. If a router does not have a feasible successor, what action will it take? Answer: If the router does not have a feasible successor in its topology table, it sends a query packet to its neighbors asking whether they have a feasible successor. Q2. When does EIGRP need to be manually redistributed into another EIGRP process? Answer: EIGRP needs to be manually redistributed into another EIGRP process when the autonomous system number is different. Q3. Which timers are tracked in the neighbor table? Answer: The timers that the neighbor table keeps track of are the holdtime, the SRTT, and the RTO. Q4. What is the difference between an update and a query? Answer: An update is the routing information packet that a router will send out to inform its neighbors of a change in the network. In a query, the router has no feasible successor in its topology table for a network that is down. At this point, it queries its neighbors to ascertain whether they have a feasible successor. If they do, this route becomes the feasible successor for the original router. Q5. When does EIGRP recalculate the topology table? Answer: Enhanced IGRP recalculates the topology table whenever it receives a change input to the topology table. This could be a change of metric for a physically connected link, a change of status of a physically connected link, or an EIGRP routing packet, either an update, a query, or a reply packet. Q6. EIGRP has a default limit set on the amount of bandwidth that it can use for EIGRP packets. What is the default percentage limit? Answer: The default percentage limit of bandwidth allocated to EIGRP packets is 50 percent. Q7. State two rules for designing a scalable EIGRP network. Allocation of addresses should be contiguous to allow summarization. A hierarchical tiered network design should be used, to allow summarization. Sufficient network resources (both H/W and S/W) should be used on network devices. Sufficient bandwidth should be used on WAN links. Appropriate EIGRP configuration should be used on WAN links. Network monitoring should be used. Q8. What is the preferred configuration for a hybrid multipoint NBMA network when one VC has a CIR of 56 kbps and the other five VCs each have a CIR of 256 kbps? Answer: The preferred configuration for a multipoint NBMA network, in which one circuit is lower than the other circuits, is to create a point-to-point subinterface for the lower circuit and then to configure the bandwidth to reflect the CIR of the link. Another subinterface should be created as a multipoint interface with a configured bandwidth that equals the aggregate CIR of all the circuits in this instance 5 × 256 kbps, or 1280 kbps. Q9. With four Frame Relay circuits in a multipoint solution and a bandwidth configuration of 224, what is the allocation per circuit, and where would the bandwidth command be configured? Answer: The command would be configured on the physical interface. The CIR of each circuit is 56 kbps. Q10. Explain the purpose of the command no auto-summary. Answer: The command no auto-summary is used to turn off automatic summarization, which in EIGRP happens at the NIC or major network boundary. This command is necessary in manual summarization and precedes the summarization commands. Q11. Explain the meaning of the command ip bandwidth-percent eigrp 63 100. Answer: This command overrides the default bandwidth of 50 percent that is allocated to EIGRP for network overhead. This command sets the bandwidth allocation to be 100 percent of the link for the EIGRP AS of 63 on the interface upon which it is configured. This command would be used if the bandwidth command had set the logical bandwidth of the link to be artificially low. Q12. EIGRP may be used to send information about which three routing protocols? Answer: EIGRP can be used as a routing protocol for IP, IPX, and AppleTalk. Q13. Which EIGRP packets are sent reliably? Answer: The packets that EIGRP sends reliably are updates, queries, and replies. It uses the Reliable Transport Protocol (RTP). This is necessary because EIGRP does not send out periodic updates, and this mechanism ensures a loop-free synchronized network. Q14. In what instances will EIGRP automatically redistribute? Answer: EIGRP will automatically redistribute between itself and IGRP as long as both processes are running the same autonomous system number. EIGRP also automatically redistributes between the LAN protocol and EIGRP. EIGRP for IPX automatically redistributes into IPX for RIP/SAP and EIGRP for AppleTalk; it similarly redistributes automatically into RTMP. Q15. How long is the holdtime, by default? Answer: The holdtime is three times the Hello timer, which is 15 seconds or 180 seconds, depending on the medium. Q16. What is an EIGRP topology table, and what does it contain? Answer: The topology table contains every network and every path to every network in the domain. The metric for every path is held along with the metric from the next logical hop or neighbor. The table contains the outgoing interface on the router through which to reach the remote network and the IP address of the next-hop address. The status of the route (passive or active) is also recorded. The topology table also keeps track of the routing packets that have been sent to the neighbors. Q17. What is the advertised distance in EIGRP, and how is it distinguished from the feasible distance? Answer: Advertised distance is the metric that is reported by the neighbor router(s). Feasible distance is the metric that is reported by neighbor router(s), plus the cost associated with the forwarding link from the local interface to the neighbor router(s). Q18. What EIGRP algorithm is run to create entries for the routing table? Answer: The Diffusing Update Algorithm (DUAL) is run on the topology table. It is used to determine the best path and to build the routing table. Q19. When does EIGRP place a network in active mode? 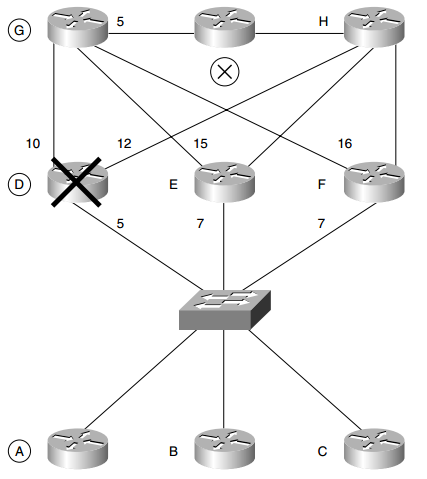 Answer: EIGRP places a network into active mode when there is no feasible successor in its topology table. Q20. By default, EIGRP summarizes at which boundary? Answer: By default, EIGRP summarizes at the NIC or major network boundary. Q21. What is Stuck in Active? Answer: Stuck in Active (SIA) is a state in which a router will place a route after it has failed to hear a reply to a query that was sent to a neighbor. EIGRP sends a query when a route is lost and another feasible route doesn’t exist in the topology table. The SIA is caused by two sequential events: First, a route has gone away. Second, an EIGRP neighbor (or neighbors) has not replied to the query for that route. When the SIA occurs, the router clears the neighbor that has not replied to the query. When this happens, it is necessary to determine which neighbor has been cleared, keeping in mind that this router could be many hops away. Q22. What is the variance command used for? Answer: The variance command is used to determine additional paths to be included in load balancing traffic to remote networks. The command is used in conjunction with the multiplier number. This number multiplies the path with the best (lowest) metric by the number stated as the multiplier. Any paths that the router knows of that have a metric value less than the result of the multiplier are included in the paths for load balancing. The amount of traffic sent across each path will be proportional to the metric value of the path. Q23. State two factors that influence EIGRP scalability. Answer: A hierarchical tiered design and contiguous addressing are both critical to being able to scale an EIGRP network. If these are in place, it is possible to summarize the network, which reduces the network resources needed for large tables and limits the query range of the router. It is also important to ensure that the router has sufficient memory, that the network has sufficient bandwidth on its WAN links, and that, where appropriate, the bandwidth command has been configured. Q24. What command is used to display which routes are in passive or active mode? Answer: The command show IP EIGRP topology shows the passive and active state of the routes that are contained in the table. The route is passive if the route is operational; it is set in an active state if the router must query its neighbors for alternative paths to a network. This command also shows the number of successors and the neighbors and distance information. Q25. What command is used in EIGRP to perform manual summarization? Answer: It is first necessary to turn off automatic summarization. This is achieved with the router command no auto-summary. Then the interface command IP summaryaddress as number address mask is used to define the summary address to be used. Q26. For Frame Relay, when would you configure the physical interface (as opposed to a subinterface) with the bandwidth command? Answer: If all the circuits have the same CIR, the bandwidth command may be used on the physical interface. The interface will divide the available bandwidth set on the command by the number of circuits. Q27. Which command is used to display all types of EIGRP packets that are both received and sent by a router? Answer: The command debug eigrp packet displays the types of EIGRP packets that are both sent and received by the router.